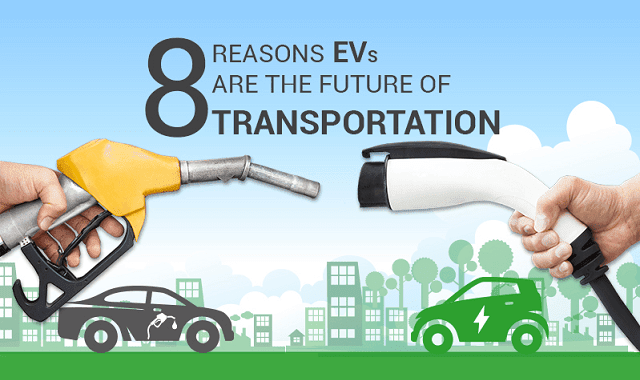 8 Reasons EVs are the Future of Transportation #Infographic ~ Visualistan '+g+"
The power of the EV is undeniable, and top players in the auto industry are already investing heavily in this new technology. By 2020, Tesla plans to have build 1 million EVs, and Ford has committed to developing 13 new models with a $4.5 billion budget, to be completed for the same year. As Ultra Low Emission Zones (ULEZs) increase worldwide, experts predict EVs will make up 35% of new car sales by 2040 – and it’s not just the auto industry who’s feeling the push to invest in these vehicles, the use of EVs is growing in the industrial sector as well. Shipping companies such as UPS are investing in EV fleets, and e- highways – which use an electric system to move heavy goods vehicles – have gained success with Sweden adopting the first in the world. As well, consumers can expect to operate and maintain these vehicles easily and efficiently. Battery swapping – essentially filling up a gas tank – takes under five minutes, and new technology uses solar and wind energy to charge batteries, saving consumers money. Referred to as “the heart of future sustainable transportation systems” and “necessary to meet sustainability targets” by the International Energy Agency (IEA), EVs are quickly becoming the clear choice for our transportation. If you’re undecided about the value of EVs, read through the below infographic for the most recent statistics and insights about this incredible technology.